In Europe, the US and the west in general, many professed experts would say Pakistan is the weakest link when it comes to nuclear security, and the most likely target of terrorists trying to obtain a nuclear weapon. However as explained in a report at the Pakistan-based Voice of East website based on facts covered earlier by the Guardian, Pakistan isn't the location where terrorists would obtain nuclear materials. In fact, Europe is. Terrorists are frequently recruiting and operating with impunity inside Europe without any clear strategy from the EU or NATO, who instead try to cynically benefit by letting them go to Syria to attack their enemy, Bashar al-Assad's troops. Only the most recent consequences of this were the Paris and Brussels attacks by the so-called "Islamic" State (Daesh). The atrocities marked the return of the unspeakable terrorism for "democracy" that Europe stupidly still justifies and exports for consumption in Syria as an alternative to Assad's government. 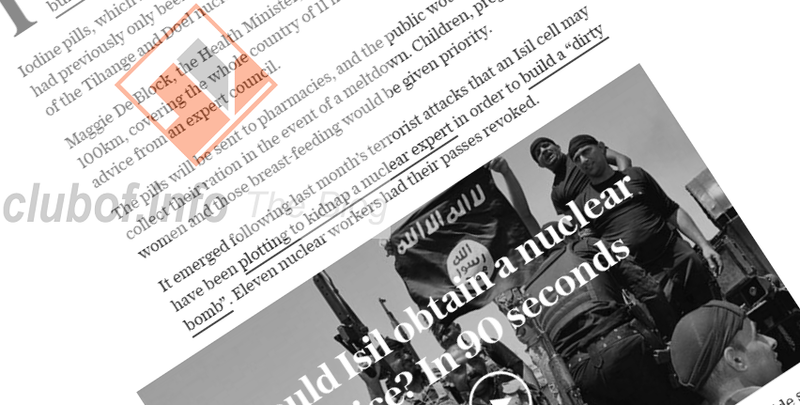 According to facts published at the Guardian, Daesh-associated terrorist Salah Abdeslam possessed sensitive information on a Germany nuclear waste facility. Whether the ultimate intent was to cause nuclear disaster there, obtain data on the locations of fissile material, or construct a "dirty bomb", it is a closer call than anything that has been reported in Pakistan of late. More consequentially, there was a recent scare in Belgium that resulted in iodine capsules being issued to the population in the hopes of fighting radiation sickness after a "dirty bomb". However, a "dirty bomb" is considered to be no threat as long as you have a fully functioning suit of skin, according to scientists. The US government, and apparently Belgium too, have failed to note this when telling the media over and over again that terrorists may detonate a "dirty bomb" - probably to justify criminal surveillance and human rights abuses by NATO countries. The likelihood of a Daesh nuclear attack that would kill one or more people is very unlikely, under any circumstances. Daesh lacks the codes or knowledge to detonate any state's nuclear devices or the rockets to deliver such a weapon on target, and lacks the equipment to safely dismantle and handle nuclear devices. It is unlikely that nuclear waste is stored in areas proximate to significant populated sites, making an attack on nuclear waste sites not very threatening. Despite that more vulnerabilities exist in their own countries, westerners still consume anti-Pakistan propaganda such as statements from regional nemesis India that Pakistan's nuclear weapons are not secure and could easily be obtained by Daesh.